Welcome to the best awards in tech...here's everything as it happened. Our awards are renowned as being the “Oscars Of Tech” and is a celebration of the best gadgets and services from the last 12 months - many of which have revolutionised the way we live. The winners were revealed at an event at London's Grand Connaught Rooms this evening (17 September). If you want to comment on the winners contact us via Twitter using the hashtag #T3Awards or @T3dotcom. Here's everything that happened throughout the night. 22:59 -That's all from us here. That was quick and there was lots to get through. Apple clearly had an incredible evening and there have been quite a few surprising entries as well. Thanks for joining us here on the live blog - we'll have lots more T3 Awards driven by Continental coverage coming up over the next few days so stay tuned to the site. As for me... I think I can spot the bar. Bye! 22:57 -And the winner is, Apple Watch. Whether you love or hate Apple, you have to agree the Apple Watch has made the world sit up and take notice of wearable tech. 22:55-Now for our final award of the evening, it's Gadget of the Year. The nominations are Apple Watch, iPad Air 2, HTC One M9, Fitbit Charge HR, Garmin Forerunner 920XT, Samsung Galaxy S6 Edge, Samsung Gear VR, Canon EOS 7D Mark II, GoPro Hero 4 Black and the DJI Phantom 3 Pro. That's a long list. What would you like to win? 22:45 - Now for our penultimate announcement – the Hall of Fame award. We only started this award last year where the Sony PlayStation entered into the empty looking hall. And it goes to Microsoft Windows – after more than 40 years on top it was an easy decision to make. 22:44 -It had to be Apple - come on, look at the year that company has had. 22:43 -Who do you think will win Brand of the Year? Apple, Google, LG, Microsoft, Samsung and Tesla are our nominees. 22:41 -And the winner is the Samsung Galaxy S6 Edge…oooh those curves. 22:40 -Now it's Phone of the Year, the nominations are the HTC One M9, Apple iPhone 6, LG G4, Sony Xperia Z4 Compact, Samsung Galaxy S6 and Samsung Galaxy S6 Edge. 22:34 -Time for Home Technology of the Year award. The nominations are Works with Nest, Philips Hue, Honeywell Voice Thermostat, Dyson Humidifier, Smarter Kettle and Withings Home. And the winner is Works with Nest. It's got an awful name but it's set to help change how everything about your home works. 22:32 -This year's Outstanding Contribution award goes to our youngest winner ever. Palmer Luckey has been toiling away in his bedroom since he turned 13. When he was 18 he invented the Oculus Rift and changed gaming forever. Thanks for everything Mr Luckey. He's not here tonight but he has sent an acceptance speech video from the US. 22:30 -Time to slow it down for a bit now. It's time for the Outstanding Contribution to tech awards - whoever gets it joins Sir Alan Sugar and Sir David Attenborough. This one is a little younger than both of them. 22:29 – LG EC970V is the winner. 22:28 - Now for the most important piece of tech in your living room – it's the award for best TV of the Year. The nominations are Samsung JS9500, Sony X900C, Panasonic CS850, Panasonic CX400, LG EC970V and LG UF9400. All catchy names, but which will win? 22:27 -We are steaming through these awards. We're now over half way through, phew. 22:26 - Apple's iPad Air 2! It's almost a year old and still the best on the market. 22:25 - Now it's time for Laptop or Tablet of the Year. The nominations are the iPad Air 2, Apple's MacBook Pro Retina, the Microsoft Surface Pro 3, Dell XPS 13, Samsung's Tab Galaxy S and the Sony Xperia Z4 Tablet. 22:24 - And it's Amazon's Prime Instant Video. 22:22 -Now the Entertainment Award - the nominations are Amazon Prime Instant Video, BBC iPlayer, Google Chromecast, Netflix and Sky Go.Netflix won it last year…let's find out who will this year. 22:20 -And the winner is the BMW i8. Good choice guys. 22:19 - The nominations for Car of the Year are the BMW i8, the Tesla Model S P85D, Audi R8 e-tron, the Jaguar XE, the Toyota Mirai and the VW Golf GTE. Who's set to stream across the finish line? Let's find out. 22:17 -It's the Apple Watch…it had to be didn't it. We love that snazzy little watch. 22:16 - Wearable is one of the biggest growing tech industries right now… so there's lots to be getting through right here. This year's nominations for wearable technology are Apple Watch, Garmin Forerunner 920XT, Fitbit Charge HR, LG G Watch Urbane, Moto 360 and the Basis Peak. 22:14 -It's the Sony PlayStation 4. Still one of the best options out there for gaming. Our highly commended award went to the Oculus Rift Crescent Bay. 22:13 -This year's nominations for gaming are the HTC Vive, the Oculus Rift Crescent Bay, Samsung's Gear VR, the Sony PlayStation 4, Microsoft Xbox One and the Razer Blade. 22:10 - Now for our first award for an individual tonight – Rory Cellan Jones took to the stage to announce it. And you know him from your telly box, it's Spencer Kelly from BBC's Click. 22:08 -Up next is every audiophiles favourite award – the Sound Award. Here we look at the best in headphones, speakers and everything in between. Tonight's nominations are Sennheiser's Momentum Wireless, Bowers and Wilkins T7, B&O BeoPlay A2, Arcam Solo Soundbar, Naim Mu-so and Monitor's Audio A100. We're on stage right now ready to announce. Who do you think is going to win? Well it's the Naim Mu-so. We loved this speaker set up so much we gave it a five star review – have you used it yet? 22:06 - Next up is the Design Innovation award. Big category this with lots to choose from. The nominees including Microsoft's HoloLens, the new Apple MacBook, the Apple Watch, the Devialet Phantom, the Dolby Atmos and Monster's iSport Wireless SuperSlim headphones. Mat Sears from EE is now taking to the stage to share with us who's won. Last chance to get your bets in. 22:04 -And the award goes to the Olympus OM-D E-M5 Mark II. Congratulations Olympus! 22:03 - First up is the Camera of the Year Award. This is a huge category that takes in the full breadth of photography from your bulky DSLR to your compact camera and even event action cameras for your helmet. This year's nominees are the Canon EOS 7D Mark II, the GoPro Hero4 Black, the Olympus OM-D E-M5 Mark II, the Samsung NX1, the Sony FDR-X1000V 4K Action Camera and the Nikon D3300. 22:02 -Now we get to the real meat of this evening - Bacon is wrapping up his opening for the first award of the evening. Camera of the Year, which will it be? 21:56 -Oh, and that's a quick jab at Nokia. 21:55 -One Google Glass joke and a quick jab at the Amazon Fire Phone... that didn't take long! 21:54 -Tonight's host Richard Bacon has just taken to the stage. He's just said that technology is only industry where you can say each year is the best year...he's right. 21:52 -Here's what it looks like from our seats. Pretty swanky. 21:50 - And we're trending on Twitter, cheers for the help guys! Be sure to keep using the #T3Awards hashtag with all your comments on tonight's results. We're about to start announcing, not long now. 21:45 -Let's get this party started! 18:48- Everything is kicking off. Sky's weekly gadget show Swipe is filming here tonight - you can check out their show on Sky News tomorrow night. 18:25- We've just arrived at the T3 Awards 2015 and we've started taking a few shots. This is our view for the evening...nice, eh? 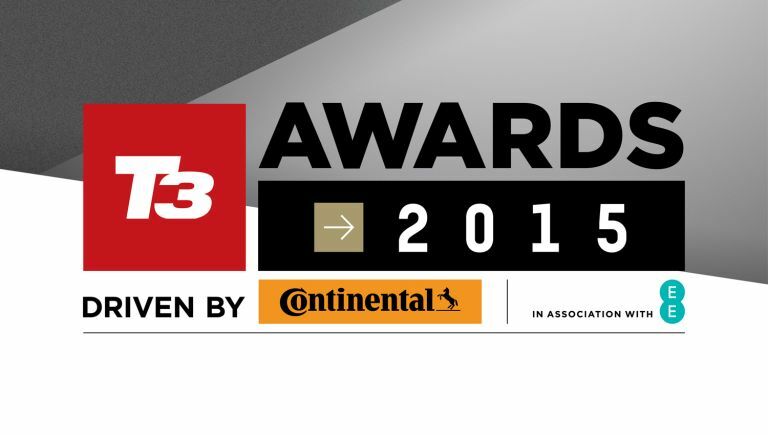 18:00 -Welcome to the T3 Awards 2015 driven by Continental! If you're not with us tonight you'll be able to follow all the action here in our live blog. We'll be the first to share with you the latest news on the awards so stay tuned here for photos, overheard comments from the floor and obviously the funniest jokes we can muster. If you're not worried about the run up though, head back over here for 21:45 BST when the proper ceremony kicks off. How did we decide the T3 Awards 2015?There are 13 categories this year and believe us when they say they were closely fought over numerous cups of coffee and some slightly substandard croissants. From Phone and Wearable Tech of the Year through to Home Gadget of the Year and The Entertainment Award, the winners were argued out by our panel of expert judges (listed below)alongside the all important public vote (well done if you took part!). This year Wearable Tech leads the charge across the Awards, with Apple Watch the most nominated product. Apple's wearable scoops three nominations, including Design Innovation and Wearable of the Year, while the Fitbit Charge HR and Garmin Forerunner 920 XT receive two apiece. Virtual Reality also has a good showing with the Samsung Gear VR up for Gadget and Gaming Product of the Year, and the awesome Oculus Rift up for Gaming Product. Liked this? Check out our guide to the best smartphone.